FREE SHIPPING ! Fedex ground in contiguous US. Signature Required. FREE SHIPPING for Variocages in Contiguous United States! The Variocage Compact has been designed for hatchback vehicles with high thresholds. The front of these crates have a shorter door and a threshold that is nine inches from the base of the crate to the door opening to allow the crate door to swing open when the hatch of the car is lifted. Why choose Variocage? Mim VarioCage is the only dog travel cage on the market today that has been tested in both frontal and rear collisions. It has also been in a drop test which simulates a rollover with a car. The crash tests have been made by the Technical Research Institute of Sweden. • Mim VarioCage is adjustable in depth. This means you can adjust the depth for the trunk. This can be a great advantage if you change your car as it makes the cage more flexible. • Mim VarioCage is lockable with a key. Pet owners also have the ability to lock the cage with a padlock. • Mim VarioCage has an escape hatch. It is very helpful if you need to get the dog out after a collision where the cage will not open or if you have lost your keys. • Mim VarioCage is delivered with a ribbed rubber mat that you can put on the bottom of the cage. This mat is resistant to urine and to collecting dirt. • Unlike rigid steel framed crates that are not designed to absorb and distribute impact, Variocages are designed with telescoping poles & crumple zones, so the crate takes the impact of an accident, not you or your dog! What is the difference between a Vario Cage and other dog crates on the market? The Mim Variocage dog crate is constructed with telescopic tubes and a roof and floor that is separated into two parts, which allows you to adjust the depth. This adjustability feature is also a crash safety (crumple zone) feature. In a collision from behind, the floors, ceilings and the telescopic tubes will be pushed together and this crumple zone reduces the risk that those who sit in the back seat or up against the crate, get hurt. When Mim crash-tested a regular steel cages with a solid frame model of cage, it broke the back seat. Vario Cage has crumple zones, just like a car, which means that it will deform upon impact. Vario cage can save your life and your dog’s! The cage is safe and very practical. Space is left for other items. In a few simple adjustments the depth of the cage can be adjusted to the size of your car. When you carry two dogs in the car, they should sit separately and not be able to reach one other. The mid-section easily adjusts sideways if one of the dogs needs more space. If you have a large dog or if you want to give a single dog more space, the mid-section is easily detached. The cage can easily be “tailor-made” for the car by the owner. If the front gates are blocked the escape door can be used. In a few simple operations the rear section can be removed. In a rear-end collision the cage will be compressed in a controlled manner to the same extent as the crumple zones of the car. This means that the rear seat back will not be pushed forward by the cage, minimizing the risk of damage to both passengers and dog. 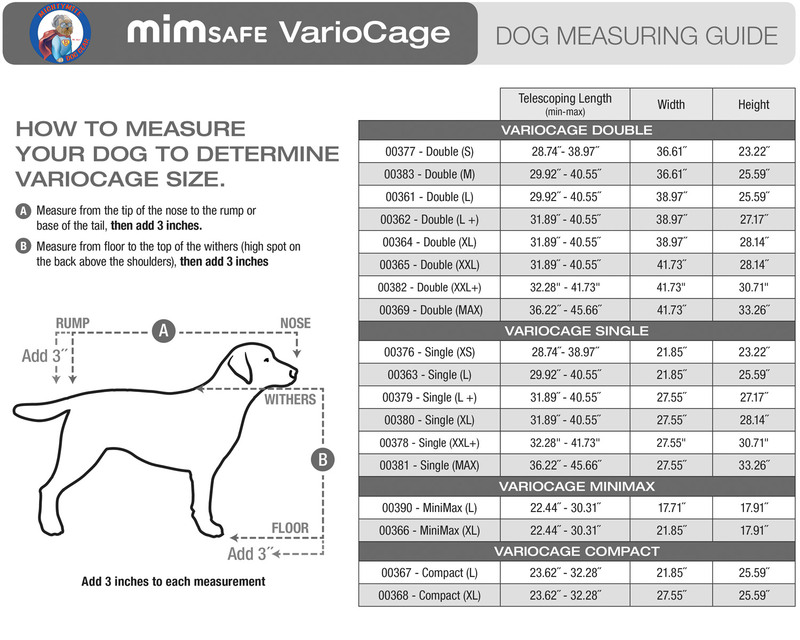 Here are some helpful hints when measuring your Pet for a Variocage. * Please note that it is important to measure your dog first before measuring your vehicle. Proper fit for your dog is vital to your dog’s comfort and safety. * Hold the measuring tape in one hand and place the free end at the front edge of your dog’s nose pulling it straight back to the base of his tail. This will give you the length measurement for your cage. You will need to add Three (3) inches to allow the dog room to turn around in the cage. * Place the tape at the top of the shoulder and measure down to the floor to get a proper height measurement. Add Three (3) inches to give the dog plenty of room if he wants to stand up. * Be sure to estimate your dog’s adult size if you order his crate while he is still growing. You can check his breed standard to get an estimate of what size he will reach at maturity to make sure your crate is large enough. * Never handle your dog roughly while measuring him. Many dogs are easily frightened and one bad experience can make your dog reluctant to be handled in the future. * Proper measuring will assure that your pet can comfortably stand, sit, turn around, and lie down in his cage. You can always add a divider panel in the MIM Safe Variocage Double if necessary, and reserve the remaining space until your pet grows into it. * As a general rule, if you’re not sure which size to select for an adult dog, lean toward a larger size. Here are some helpful hints when measuring for a Variocage to fit your vehicle. * Proper use of the Variocage relies on the Crumple Zone Protection designed in to your Vehicle and the Variocage. For best safety and by design, the Variocage must be facing lengthwise in the vehicle for maximum protection of both your dog and human occupants. Please make sure you measure your vehicle with this placement and positioning of the Variocage in mind. * Depending on your vehicle, the length of the Variocage may need to be adjusted to fit. Please make sure the length is suitable for your dog with the cage adjusted to fit your vehicle. In some cases a double cage without the divider may offer more room for a larger dog than a single cage. * Check to see if your car has a sill in the back by the rear door. You might have to put something under the cage to raise it up slightly if the sill is taller than 2 inches so the Variocage doors can open. * The Variocage is safest mounted level on a flat surface secured to the floor in your vehicle. It is important to use the straps provided with the Variocage to secure it to the tie-down hooks in your vehicle. These straps are integral to the safety design of the Variocage. The straps are engineered to give way in a severe impact allowing the Crumple Zone Protection of the Variocage to work properly. * Measure the widest point of the cargo area in your vehicle. Typically, the point between the wheel wells will be the narrowest point. However, in some cases, the rear portion of the cargo area or the rear door entryway can be the narrowest point. Also, please note that the rear door entryway may have rounded corners at the top. In this case, check the height of the Variocage against the same height of the rear door entryway to assure it will fit through the narrowest point of the entryway. * Measure the height of the opening for the cargo area and the height of the cargo area itself. Maximum height is measured from the floor to the lowest point of the rear door entryway. Please note that the rear door entryway may have rounded corners. In this case, measure the shortest point, i.e. not in the middle of the rear door entryway. * Measure the length of the cargo area floor. Please note that the rear door hatch may be curved or angled inward towards the interior cargo area of the vehicle. In this case, please check the height of the cage you wish to fit in your vehicle and measure from that point lengthwise to the rear seat and see the note below regarding the angle and length of the cage at its maximum height. NOTE: MIM Safe – Variocage is suitable for use in Station Wagons, Minivans, and SUV’s. The Variocage is also angled towards the top on both the front and the back of the cage and is adjustable in length so it can fit in a variety of vehicles. The slope of the front and back of the crate is approximately the same as the slope of the backseat. The roof of the crate is several inches narrower than the floor in consideration of the angle of the back seat as well as the angle of the rear entryway door. MIM continues to improve their product and has now released the third generation Variocage, which has passed the crash tests. In a rear-end collision the Variocage will be compressed in a controlled manner just as the crumple zones of the car function. This means that the rear-seat back will not be pushed forward by the crate and also that there is a limit to how much the crate can crumple inward on the dog. These features minimize the risk of damage to both passengers and dog. * What type of vehicle is best suited for use with the MIM Safe – Variocage? ~ MIM Safe – Variocage is suitable for use in Station Wagons, Hatchbacks, Minivans, and SUV’s. * What is the correct way to install the MIM Safe – Variocage in my vehicle? ~ MIM Safe – Variocage is designed for placement behind the rear seat (or a barrier similar to it), with the sidebars travelling in the direction of the car. This placement allows the cage to follow the crumple zones of the car if in a crash. * Why is it recommended that the cage be up against a rear seat back when installed in a vehicle? ~ MIM Safe – Variocage is designed to stand behind the rear seat for added support in case of a crash. There are also tied downs that come with the cage to keep it secured to your vehicle’s tie-down points. If the rear seat is folded down, and only the tie-down straps are used to keep it in place, it could present a danger to the driver in the event of a severe impact. * Can I carry two (2) dogs in a double cage and keep them separated from each other? 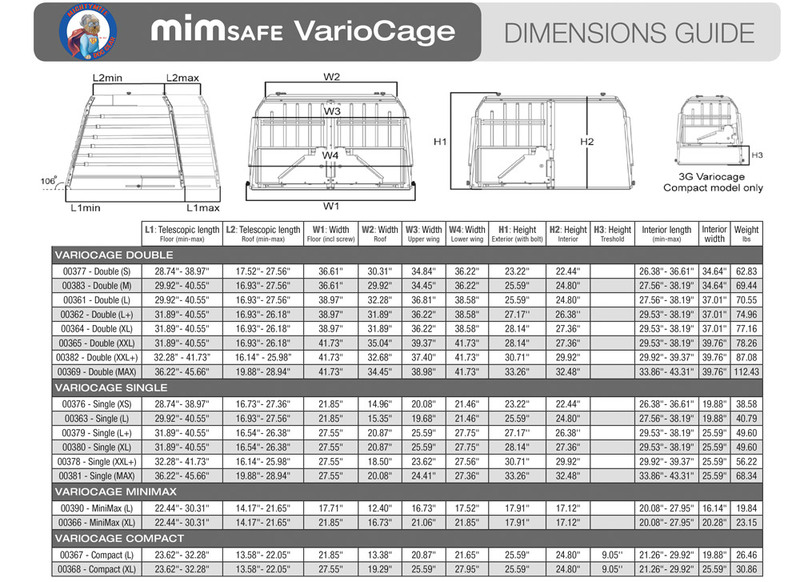 ~ MIM Safe – Variocage includes a removable divider with all Double Model Cages. The divider is recommended for traveling with two (2) Dogs. The divider will partition the cage so you can travel safely with two (2) dogs … one on each side. Also, when traveling with one dog, the other side if very useful for luggage, groceries, supplies, and materials storage. In the event of a crash, these objects will be contained and not present a hazard to occupants in the vehicle. * Can I carry more than two (2) dogs in a double cage and is it safe? ~ MIM Safe – Variocage Double Models have only been tested with two dog dummies. If you have smaller dogs you can transport them if they are all small enough to fit comfortably in a larger MIM Safe – Variocage. In fact, it is better that smaller dogs in a larger cage have les room to tumble around in in the event of a crash. Transporting two (2) smaller dogs in a larger cage is better than putting One (1) smaller dog in a larger cage. However, if you put a small terrier breed in a Double XXL Cage by itself, and have a crash, the potential for harm is greater. Again, a single dog in a smaller cage is better than a single dog in a larger cage. Our cages are not that big that it would work for more than two (2) of the larger breeds. * What if I have a Minivan or SUV with 2nd row Captain’s Chairs? ~ MIM Safe – Variocage can be installed in a Minivan or SUV with the 3rd row seats folded down or removed. The 2nd row Captain’s Chairs would then act as the rear seat. This should work even if there is a gap between the Two (2) Seats. Please make sure the MIM Safe -Variocage is strapped down properly to the anchor points in your vehicle and that you have support from the 2nd row seats for the cage. Every seventh traffic accident is a rear collision. The rear cargo area is part of the crumple zone that is designed to protect the occupants in collisions. A rear-end collision pushes in the car’s rear end and items placed in the cargo area are pushed forward. If there is a dog car crate in the cargo compartment, it will move forward toward the rear-seat backrest and it can be crushed depending on the vehicle, dog crate, and severity of impact. In severe collisions, it is also possible for the dog crate to break the backrest and subsequently injure a passenger. For more than 20 years, MIM has worked with functional designs of safety details in the vehicle industry and they have documentation from hundreds of crash tests. Using this information and their experience, MIM developed a vehicle dog safety crate following the major car manufacturers’ use of crumple zones. Then they worked with Swedish government agencies to develop the Safe Pet Crate Test to test the safety of passengers and dogs in crates during a traffic accident. Be the first to review “MIM Variocage Compact” Click here to cancel reply.